It was easy to laugh at Futurama’s Professor Farnsworth when he unveiled the Smell-O-Scope. What use could there possibly be for a device that detects and measures odors? As it turns out (in the cartoon and in real life) the Smell-O-Scope is a pretty handy tool. But the Professor didn’t invent it; smell detectors, called olfactometers, have been around since the late 1960s. The most popular olfactometer on the market today is the delightfully named Nasal Ranger. The telescope-shaped meter is fitted with a small mask at one end and a dial at the other. Inquiring sniffers put their nose into the mask and inhale, then use the dial to determine the strength of the odor. 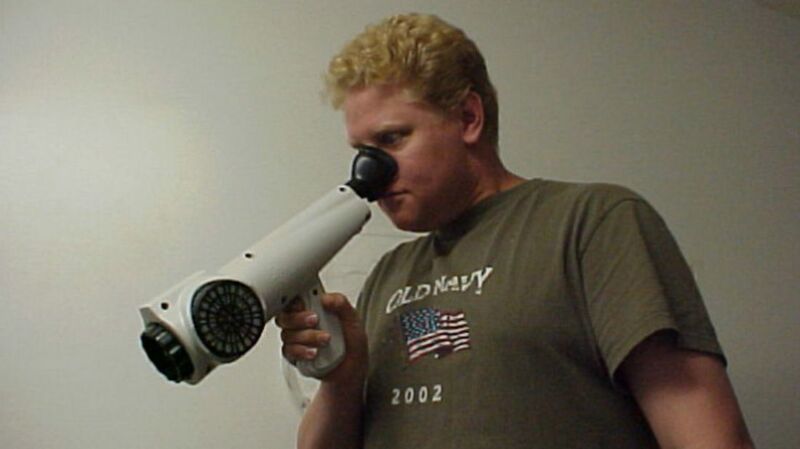 The Nasal Ranger may look silly, but its users are deadly serious. Environmental health departments, wastewater treatment plants, landfill managers, and even police departments whip out the Nasal Ranger when things start to stink. Measuring the intensity of an odor can help locate the source of the problem [PDF]—or identify who’s breaking the law. Some time after marijuana was legalized in Colorado, state officials realized they’d have to create some new ground rules. Residents had begun complaining about the pall of pungent pot smoke that hung in residential areas and near grow facilities, so the city of Denver passed an ordinance [PDF] banning intense marijuana odors. Any smell measuring more than 7/1 dilutions to threshold on the Nasal Ranger would be considered a nuisance, and the people responsible would be fined. To enforce this ban, investigators armed with Nasal Rangers patrol the city, responding to smell complaints, of which there are plenty. The olfactometers are a welcome sight to some. To others, it’s something of a joke. The pot culture magazine High Times asked two of its correspondents to test-drive a Nasal Ranger. Unsurprisingly, they used it to get high. Smell is a vastly underrated component of our everyday experience. St. Croix Sensory, the Minnesota-based company that makes the Nasal Ranger, offers a surprising menu of sniff-enhancing experiences. There’s the Nasal Ranger and scent-tracking software, of course, but you can get your products, materials, or environment tested for smells; enroll in Odor School; or even add “smell-scapes” to your art installation or theatrical production.